AMD's HBM promises better performance in a smaller space. Sitting down to talk graphics memory isn't usually anyone's idea of a good time but these are the chips that underpin everything from GTA V to 4K Netflix - and AMD just unveiled the memory technology it wants to power the GPUs of the future. 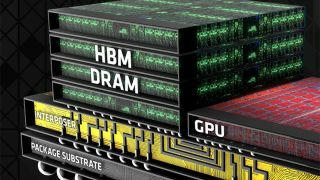 Seven years in the making, High Bandwidth Memory (HBM) promises to provide huge improvements over the GDDR5 memory currently sitting inside AMD's top-end graphics cards and the PlayStation 4 - it offers greater performance in less space using less power. It changes the layout of memory chips from the ground up - chips are stacked vertically like skyscraper floors in a 3D pattern (not unlike 3D technology used in SSD), and new interconnector technology ensures low power consumption and high bandwidth capabilities. Temperatures come down too. Graphics cards will soon be shrinking significantly thanks to HBM. A comparable 1GB graphics chip takes up just 6 percent of the surface area measured against GDDR5, and smaller power supplies can be used too. That could lead to top-end graphics cards half the size of today's, AMD says. Key to the potential of HBM - as its name suggests - is the bandwidth, or the amount of data it can cope with at once. It means CPU and RAM performance can be increased without hitting a bottleneck on the GPU side of the equation. "We needed a new memory that was far, far better from a power perspective," said AMD's Joe Macri at a briefing with journalists. "There's [also] a massive increase in bandwidth. We have basically blown through the bandwidth-per-watt wall... I'm astounded at what we've been able to achieve." With Nvidia working on next-generation graphics technology of its own, battle between the two graphics giants will be renewed in earnest in the very near future - HBM is slated to appear in AMD's flagship graphics cards later this year. AMD hasn't said whether that technology might be used or will be used in standard RAM; AMD sells a range of high-performance memory modules.